Theme weddings are all the rage and as always we like to help with ideas for our Brides and Grooms to be. Some theme weddings are pretty bizarre, but unless you’re keen on tandem bungi-jumping or diving out of an aircraft with an instructor who delivers the nuptials in mid air (believe it or not these have been done) you might want to know about a few very popular themes that have proven to be great successes and could make your wedding pretty special. So let’s start with ABC (there will be more in articles to follow) …and look at three very popular ideas that could make your theme wedding a dream wedding! This is a popular wedding theme and is so picturesque and colourful, that it has fulfilled many a little girls dream on the big day. Starting with the romantic venue, make sure it fits the theme and is a venue that assists with your ideas. Everything is essentially ‘old world’ from the invites to the dress which should be the kind of thing Grandma might have worn at her wedding – or better still, Great Grandma! Many brides have actually worn their Great Grandma’s wedding dresses (with maybe a few modifications) at this type of wedding. Decor is maybe old ‘penny farthings’, or as the theme suggests, antiques of any kind. These should extend through from venue decor to table decor, which could be old books or lamps etc. It is a wonderful theme that lends itself to a sophisticated and romantic wedding …a great touch is for the Bride to arrive and be photographed in a vintage car. These are freely available for hire. An acoustic guitar softly strums ‘Here comes the bride’ (or maybe a more modern alternative) as the Bride skips through the sand to be welcomed by her Husband and the Vicar who stand in an arch of Sea shells. A soft sea breeze blows and the gulls above join the chorus – sounds idyllic? It is and it’s one of the most popular wedding themes. There are 2 words of caution though – WEATHER and BACKUP. Unfortunately these weddings are absolutely reliant on good weather so you need to choose your season (or even the exact day) very carefully and please do have a backup plan! You can also think about doing this inland (travel to the coast can be very costly for inlanders), just creating all the vibes of the beach in a versatile venue. There are so many things you can do to recreate the atmosphere of the beach, from shells and seaweed decor, to beach outfits …and even sand can be brought in for the adventurous. On or off the beach it is a fun, fashionable theme that can make a special day. There are basically 2 types of costume wedding. 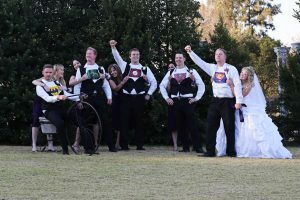 One is where a specific costume theme is chosen …and these can be just about anything from medieval to monster (A good one particularly if you get married on Valentine’s Day – another popular theme) and from Titanic to Transformers. You can have so much fun, providing you think everyone will really go along with it. Remember though that full costume can also be a costly business for your guests, so you can also do a ‘mixed costume’ theme, something like a ‘fancy dress’ party. This allows your guests to be creative and use the costuming they prefer or can afford. Whichever of these, or something totally different, that you choose, make sure your theme wedding really does become your dream wedding by partnering with a reputable professional wedding venue like ValVerde eco hotel. We have an impressive wedding planner available for free online and can help with every aspect of your wedding, whatever your theme may be. Contact us for information, viewing appointments and bookings the minute you choose the big day! Make sure your ‘dream wedding’ is realistic – Yes you know all about it – every little girl has her dream wedding. Your special day may have been played out in your head for as long as you can remember, but the first thing you need to do is consider if your dream is realistic. Create a budget and decide what is really possible. This doesn’t mean you need to burst your bubble – just make some adjustments. Create a timeline – The essence of every plan is to create timelines. A good Wedding planner will usually work from the big day backwards, to ensure that everything has been accounted for long before you get to the big day. When all the plans have been decided on – then set the date! Interview your service providers – The people you hire to carry out the important functions at your wedding can make or break your day. Get a reliable list of Service providers online and make sure you ask all the right questions, as provided in a good Wedding planner. Get expert advice – There are hundreds of articles and blogs, written by professionals, at your fingertips to assist you with all your wedding planning. These too can be obtained online and give you invaluable advice. Sign on the dotted line – Make sure that you pay attention to detail and have signed contracts with your service providers. Once again a good online ‘Wedding planner’ can give you solid advice regarding the legal obligations on both sides. Don’t let your big day be ruined by someone who didn’t make a written commitment! Choose the right venue – The venue you choose can make your dream a reality, or turn it into a nightmare. Apart from it having the right look and feel – professionalism, versatility and years of expertise all need to be credentials held by your venue of choice. Ensure that the venue you choose can meet all your needs. Go with your personal preferences – Whatever advice you may source and heed, the important thing to remember is that it’s your wedding and you need to have the wedding you Some people may want to centre proceedings more on spiritual rituals; others may want a wild party where the music is essential. Choose what works for you, but once again make sure the end result still fits into your budget and it has been planned accordingly. We trust that these 7 wedding planning essentials, without going into too much detail, will help to ensure you have an enjoyable wedding, because your day needs to be special. A highly detailed wedding planner is advisable though and one is available online from the excellent wedding venue Valverde Eco hotel. Check it out …and happy wedding planning! A wedding cake is a very traditional part of a couple’s wedding celebration and the cutting of the cake is the first deed the couple is expected to tackle – and accomplish – together. Your wedding cake will need to fit into the overall style and theme of the wedding day. When speaking to the chef or baker, convey your preferences as to whether you would like a contemporary or traditional, ornate or simple design. You may not want a tiered cake at all and instead choose a single layer cake, or even go with cake pops or individual cupcakes to hand out to guests. When choosing a tiered cake, consider the different shapes available, such as round, square, rectangular, hexagonal or so on. You can also mix the shapes up, although the most pleasing combination to the eye is a larger base working up in size reductions to a smaller top tier. In bygone days, the size of the wedding cake was chosen in order to convey the wealth and social standing of the family. Today however, the couple orders the size of the cake according to the number of servings required to cater for their guests. In general, three tiers will serve 50-100 guests. So, if you’re having 150 or more guests, you’ll likely need four or more tiers; alternatively consider ordering a three-tiered cake and then making up the rest of the slices with a sheet cake, which can be sliced up discreetly in the kitchen. If you have a small guest list but still want a tall-tiered cake, you can have your cake baker create the bottom layer out of Styrofoam and decorate it to look like the rest of the cake. Not everyone likes fruit cake – the usual filling of wedding cakes due to the firm consistency offered up – however you don’t need to choose fruit cake at all. The main point of your wedding cake should be to have the most flavourful offering that you like. If you like sponges then have that. If you would like an ice-cream cake then have that! Once you have determined the filling of your cake then you can determine the additional flavours. Your cake can be created to perfectly match or complement your wedding day colours, however stay away from using primary or bold colours in the icing and rather choose the softer shades of your wedding day colours that are more appealing to the palate. The toppings can include the colourful accents, with natural flowers or ribbon, textures and decorative accents such as lace, monograms or pieces of art. For example you could add a meaningful family heirloom, a representation of you and your partners favourite hobby, or something in theme with your locale or wedding day, such as coral, grapes, snowflakes, daisies or heather. For more advice on how to make sure the cake fits your overall theme click here to download our Ultimate Wedding Planner. There is a little more to choosing your ideal wedding venue than just looking at a few photographs in the latest copy of ‘Beautiful Brides’, or simply going on your friend’s word of mouth recommendation. The venue needs to tie up with a few vital aspects of the event – i.e. the date, the area, the type of wedding you want to have and of course what meets your budget ….to name a few …so to help you try to save some time reviewing hundreds of venues that just will not suit you, here are what we call the 5 ‘A’s to look for in a class ‘A’ wedding venue…. Area and accessibility – One of the first things most couples decide on is where they would like to be married. It may be close to home to be more accessible for a large family and many friends, or it may be a remote destination, somewhere romantic …or maybe just difficult to get to, because you don’t really want too many people there anyway! Either way there’s no point in looking at wedding venues in Cape Town if you’ve decided to get married in the bush. Occasionally couples hear of exceptional wedding venues and base their decision on that, but it’s unusual, so step 1 is to decide where the special event will be …and then seek the possibilities in that area. Availability – Usually the very first things that most couples do actually, is set the date. This often is chosen for a special meaning and so very seldom does the wedding venue’s availability dictate this. Therefore having presumably already set your date, before you even visit the wedding venue you’re interested in, find out if it will be available on that day. Affordability – So you have now found a few wedding venues in the area in which you wish to be married and they are available for the big day. Before going on site visits or starting to discuss details, unless you are amongst the lucky ones to whom money is no object, find out if the venue you seek is affordable! It’s not just about a basic venue hire fee, but many wedding venues have minimum numbers that they will accept. This factor and many others affect your bottom line, so if you, like most others, have a budget too work on, get this clear before you waste too much time looking or negotiating. Accomodation – The chances are at least the Bridal couple will want to stay at the venue on the night of the celebrations and possibly many more of your guests. Beautiful, romantic accommodation must be available if required and adequate accommodation at, or very close to, the venue should be checked also for availability, affordability and most importantly if the accommodation is Adequate? Adaptability – We had to find another ‘A’, but this should probably more accurately be ‘Suitability’. Having ticked the first 4 crucial boxes, the bottom line is whether the venue can handle every aspect of your special event. Are there beautiful surroundings, photo-opportunities, good catering, decor and all related facilities supplied by the venue or available to the venue? Is this venue exactly what you want …or can it, at very least, Adapt itself to your needs? Check these things out carefully. Just one final A that has not been mentioned and doesn’t really fall under all this practical advice (but may be the one thing you’ll choose your venue for anyway) is ‘Amazing Ambience’ …Make sure you choose a place that has it in Abundance, as this is after all, your one and only special day and you deserve to host it at a ‘Class ‘A’ wedding venue! Click here to check out the only wedding venue in Gauteng to rank among the top 20 in TripAdvisor, the world’s largest travel website. 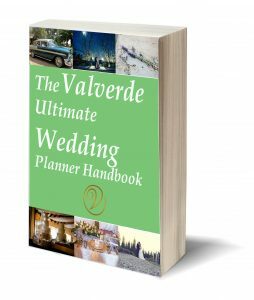 For more info and ideas on how to plan your wedding from A to Z like a wedding pro click here to download our ultimate wedding planner written by Pamina Bohrer, owner of Valverde who has been in the industry over 14 years. So you are at the point where you are looking for ideas to make your ‘special’ day exactly that, something ‘special’ and different. Well, you may be interested in some pretty unique ideas that are trending in S.A. weddings right now? In this article we focus on particularly ‘romantic’ themes, assuming that you’d like to make your day trendy but in a traditional way, where love is still at the centre and you’re not going ‘over the top’ diving off some bridge in a tandem bungi! Poetry weddings – Shakespeare, Shelley, Byron and Keats may all be quoted on the day, or more in keeping with an S.A. theme, Afrika, Clegg and Bosman …in speeches, on table napkins and even in the ceremony itself, so that your love is magnified though the beautiful words of those who have so eloquently expressed themselves. The theme can extend to dress and decor and can be simplified (or modernised) by simply quoting romantic song lyrics too. French cuisine and ‘Boule’ – Go entirely French, with an outdoor setting, serving canapé’s and French champagne and organise your guests into teams to play ‘Boule’. Also known as ‘Petanque’ it is a French game where heavy balls are tossed nearest to the jack on any outdoor surface. It is fun and elegant. Complete the scene with a French accordion player and you will feel the romance of France coursing through your veins. 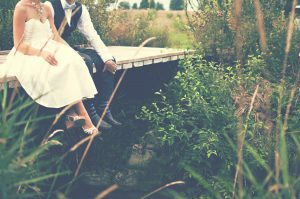 Going green weddings – as global warming threatens us and preservation of the planet is at the fore, it is a romantic notion to ‘go green’ for your wedding. It poses great ideas for dress, decor, healthy foods and even an eco friendly venue can be sought like Valverde Eco hotel and wedding venue in Johannesburg. Serve organic wines and have unplugged entertainment. Vintage weddings – These are popular and very romantic. The Bride arrives in a vintage car, Beautiful flowers, timeless decor, beautiful scrolls for wedding invitations, old miniature penny farthing bicycles and bird cages for table centrepieces. The Bride, Groom and bridal party dress ‘Gatsby’ style or even further back to any romantic bygone era. These are always stylish affairs. Breakfast at Tiffany’s – Even more stylish in many ways and certainly different, is this movie themed morning wedding. A must if the romantic couple want to get away to an early honeymoon (Choose a venue close to an airport). Glass tables, Tiffany chairs, long stemmed cigarette holders and the classic, stylish look of the forties, all contribute to this fashionable and very cost effective theme, as it is essentially a lavish breakfast, so many of the heavier costs of an evening function can be eliminated. All of these 5 romantic S.A. wedding trends can be accommodated and professionally carried out at one of South Africa’s premier wedding resorts – Valverde Eco Hotel and Wedding Venue. Contact us to arrange it all and ensure that your ‘special’ day is truly unique. If you want to unfold the secrets of how to organize your wedding like the wedding pros, click here to download our ultimate wedding planner. Written by Pamina, the owner of Valverde, after nearly 15 years in the wedding industry and having hosted over 1200 weddings at Valverde. Your very special day comes and goes before you know it. There are so ma ny important aspects to consider to ensure it is a memorable experience, but probably none more so than the preservation of the shared memories of the occasion. This means the photography is so vital, as only through this are these precious moments captured forever. This article deals with a few aspects of the photography that really need to be considered. How do I absolutely ensure my wedding photos will be right? 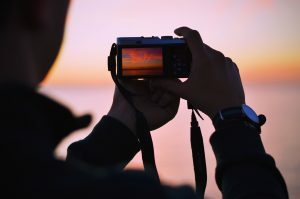 Professional Photographer – Make sure the Photographer you hire is not only a professional, but also proficient in wedding photography specifically. Uncle Harry may be the best photographer at parties and picnics, but don’t entrust him with this vital task. Even Professionals need to understand some of the particular aspects of wedding photography which are…..
Plan the shoot – Many people look at their wedding photos and think “What a pity we didn’t get that, or “so and so is not in any of the pictures!”…. Don’t make this mistake. Use a photographer that will plan the shoot with you to include everybody who is present and every expected important moment. Pair with the right place – ‘Perfect places make perfect pictures’ – This is something that every great wedding Photographer knows. He needs to be familiar with the surroundings and the various photo opportunities the venue offers…. and of course any great wedding venue has perfect photo opportunities – varied settings that offer beautiful backdrops to your most treasured portraits. Prepare a backup plan – Rainy days, wind and overcast conditions can all be unexpected and unwelcome when you need to take perfect pictures! Have a backup plan by ensuring that your chosen venue has great indoor photo ops too. Even go one better and give yourself a potential second chance. Valverde for example offer a free photo shoot opportunity after the wedding for those who may want to return on a sunny day! You only get one shot at capturing the occasion on the day it happens though. The spontaneity and magic of the moment can never be revisited, so book a venue that can pair you with a preferred wedding Photographer and use these tips to ensure you reserve your precious wedding memories! For more advice on how to organize the perfect wedding click here to download our Ultimate Wedding Planner.